In 1983, at age 15, Nadia won two Gold medals in the South Pacific Games in Western Samoa (1500m and 3000m) with a games record in the 1500m, representing New Caledonia –a territory of France next to Australia. Nadia represented New Caledonia in three South Pacific Games with 7Gold, 1Silver medals and holds the games records, in the 1500m, 3000m and 10000m. In addition has competed in two mini South Pacific Games with 6 Gold medals and records in the 800m, 1500m, 3000m and 10000m, hence New Caledonia national records plus the national record in the marathon. The first half marathon she competed in she won in Tachikawa, Japan at age 18 and her first marathon she won in 1990 in Lake Powel. Nadia won the 1994 USA road series racing from 5km – Marathon. Constantina Diţă is one of the most successful Romanian athletes of all-time, currently holding the Romanian national road records for the 5K, 10K, 15K, Half Marathon and the Marathon. Diţă finished 20th in the marathon at the 2004 Summer Olympics in Athens and went on to win the Chicago Marathon later that year, running a personal best of 2:21:30. After winning the marathon bronze at the 2005 World Championships, she became the World Half Marathon Champion. She won a silver medal at the 2006 IAAF World Road Running Championships and took third place at the 2007 London Marathon. In her career highlight, Diţă won the women’s marathon at the 2008 Summer Olympics in 2:26:44, becoming the oldest Olympic marathon champion in history (male or female) at age 38. She lives and trains at altitude in Boulder and continues her running career, competing the marathon at the 2012 Summer Olympics. Simon Gutierrez is versatile athlete as a three-time member of the USA National Cross Country team, an Olympic Trials qualifier in the marathon, and is a seven-time member of the USA National Mountain Team. He is a three-time World Masters Mountain Overall Champion (2006, 2007, and 2008) and has won the La Luz mountain race in New Mexico a record eight times. He is a three-time Champion in the Pikes Peak Ascent as well as Mt. Washington Road Race. 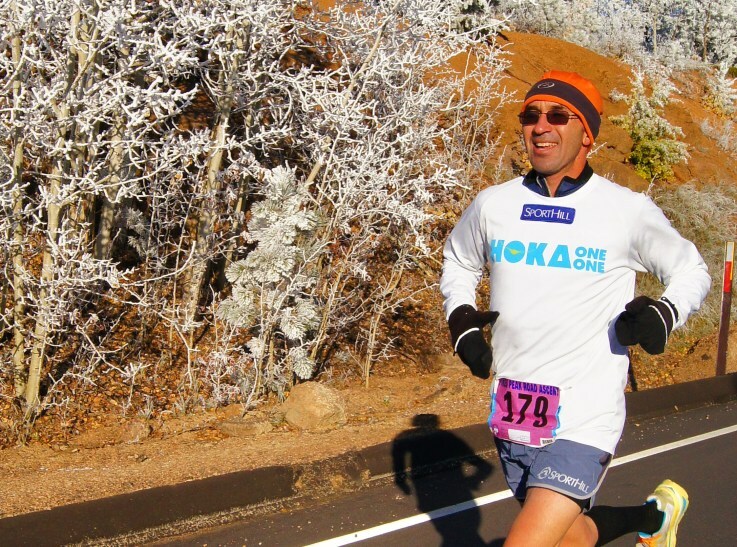 Gutierrez is also a mountain representative to the USATF Mountain, Ultra, and Trail Running Council and in 2005 he was named the USATF Mountain Runner of the Year. Now 48, Gutierrez is enjoying a career as a physical therapist in Colorado Springs. snowshoe racing, competing in over 200 races and breaking 55 records in just nine years. She has competed on the U.S. Mountain Running team five times, placing highest U.S. finisher four times. She was the Mountain Running National Champion in 2002 and 2003 as well as the Masters Mountain Running World Champion in 2004. She’s won the Pikes Peak Ascent three times, setting and holding the record time for five years in 2002 in 2:44:33. Ortiz was also the National Snowshoe Champion in 2002 and runner-up in 2004. She was named the USATF Female Mountain Runner of the Year in both 2002 and 2003 and the USATF Female Masters Mountain Runner of the Year in 2004. A kindergarten teacher and mother of four, Anita is still active in the racing community, serving as Board member for the All American Trail Running Association, the United States Snowshoe Association, and coaching elementary students on the Eagle Valley Elementary Running Team. elite and unconventional runner over his long career. Trujillo enjoyed an early cross-country running career in high school and college, but later preferred mountain running. He is a five-time champion of the Pikes Peak Marathon, holding the course record from 1973-1982. He founded the Imogene Pass Run, winning the race several times and holding the course record from 1974-1985. In 1995, at age 47, Trujillo ascended Colorado’s 54 14,000-foot peaks in record time of 15 days, nine hours, and 55 minutes. He also won the Hardrock 100 Mile Run (66,000 feet of ascent and descent with average elevation of 11,000 feet) in 1996. Trujillo has never yielded to traditional training conventions, making his achievements that much more impactful. Priscilla Welch began her remarkable running career at the age of 35, when she quit smoking and took up running under the guidance of her husband and coach, Dave Welch, and ran the 1980 London Marathon. Four years later, she qualified for the British Olympic team at the 1984 Summer Olympics in Los Angeles, placing sixth in the inaugural women’s Olympic marathon. On her 40th birthday, Welsh qualified for the Masters division and began setting age group world records. In 1987, she won the New York Marathon in 2:30:17. This was coupled with her second place finish in London where she set an age group world record running a 2:26:51, earning the sixth fastest time in the world in 1987, and holding the women’s masters marathon world record for 21 years. Welch again set an age group world record in the 1988 Boston Marathon in 2:30:48, holding the record for 14 years. Welch continued to run until a 1992 bout with breast cancer curtailed her career and she moved from her longtime home of Boulder to Tabernash, in the high country of Colorado, later relocating to Bend, Oregon. Jane Welzel is a five-time Olympic Trials Marathon participant (1984, 1988, 1992, 1996, and 2000). She has won several marathons including the 1979 Nittany Valley Marathon (2:48:47), the 1983 Philadelphia Marathon (2:36:18), and the 1988 Hokkaido Marathon (2:40:53). Following a terrible car accident in 1984 that broke her neck and left her in a body cast for three months, Welzel amazingly recovered, again qualifying for the Olympic Trials, and was named Runners World Comeback Runner of the Year in 1988. She went on to become the National Marathon Champion in 1990 (2:33:24) and then win the 1992 Grandma’s Marathon in 2:33:01, setting a personal best. She was the 1996 USATF National 25K Champion (open and master) (1:29:47), both the 1996 and 1997 USATF Master Runner of the year, as well as the 1997 Runners World Master Runner of the year. Lidia Simon is an elite long-distance runner, earning a silver medal in the marathon at the 2000 Sydney Olympics where she represented Romania. She competed in five Olympic Marathons (1996, 2000, 2004, 2008, 2012). She is a six-time participant at the World Championships in Athletics, winning gold in 2001 and taking bronze medals at the Marathon World Championships in 1997 and 1999. She holds three victories at the Osaka Ladies Marathon (1998, 1999, and 2000) and set her personal best during her win in 2000 at 2:22:54. She placed 1st in the 2007 Toray Cup Shanghai Marathon. She also won the first edition of the combined Osaka Marathon in 2011, and then again in 2012. Her half-marathon personal best time of 1:08:34 is the Romanian national record and she won the Bolder Boulder in 1999 and the Denver Rock ‘n’ Roll Half-Marathon in 2011. Jay Johnson is an elite mountain runner and record holder. He was the first American to win the World Mountain Championships in 1987, and also placed 9th in 1980, 22nd in 1991, and 24th in 1992. He held the uphill record at the 32-kilometer Sierre-Zinal Mountain Race for many years at 1:45. He won the Vail Hill Climb in 1987, as well as the Vogorno-Bardughee in 1988. He was an impressive high school distance runner, running a 2:28 marathon as junior at Paavo Nurmi in 1977, earning one of the top five times in the US. He founded the LaSportiva Mountain Cup in 2008, and is a donor & supporter of many US mountain running teams. 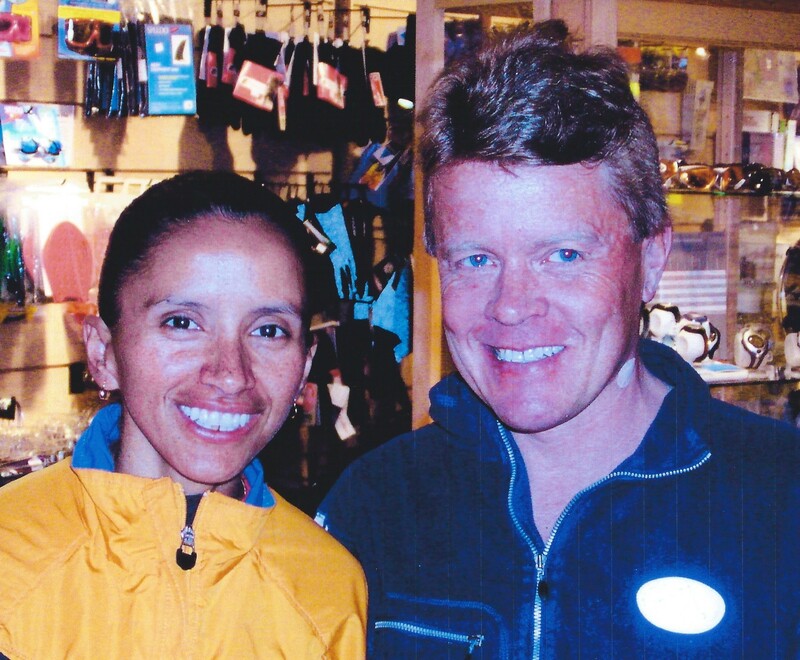 Johnson is a long-time Boulder resident and his wife Lilly, a two-time Bolder Boulder winner herself, owns Fleet Feet Sports there.